You are here to get all the Premium 40000 Prize bond draws till to date search and download. Premium Prize bond (Registered) are the newly launched by PML(N) Government for the improvement in national savings schemes who thought that the prize bond schemes does not provide a profit if your number does not match in any draw for many years. To compensate such kind of people the national savings Premium Prize bond worth Forty Thousand are very good that provided the Profit Rate is 1.5% bi-annual and totally you got 3% Profit that you have invested in buying this scheme to go in. Here is the method of how to register Rs. 40000 Premium Prize bond List 2019 in your nearest state bank of Pakistan of National savings offices. Account Maintenance Certificate ( A/C title, IBAN number, status of a/c, Bank & Branch Name). These bond are saved in that savings banks and only the number is issued to the investor by his/her name that each number equal the amount of Rs. 40000 and the Quarterly Prize Money Draws as well as Bi-annual Profit Payment make it possible to inter into the draw and if you are lucky one from the draw lucky number then the first prizes Rs. 80,000,000/- (Eight Crore PKR) will be awarded to the lucky winner. This has only one first prize. The 2nd winning prize amount is Rs.30,000,000/- (Three Crore Pkr) that have 03 lucky prizes. And the prizes of RS.500,000/- (Five Lac) worth are awarded to 660 lucky winners that fall in the third prize-winning category. 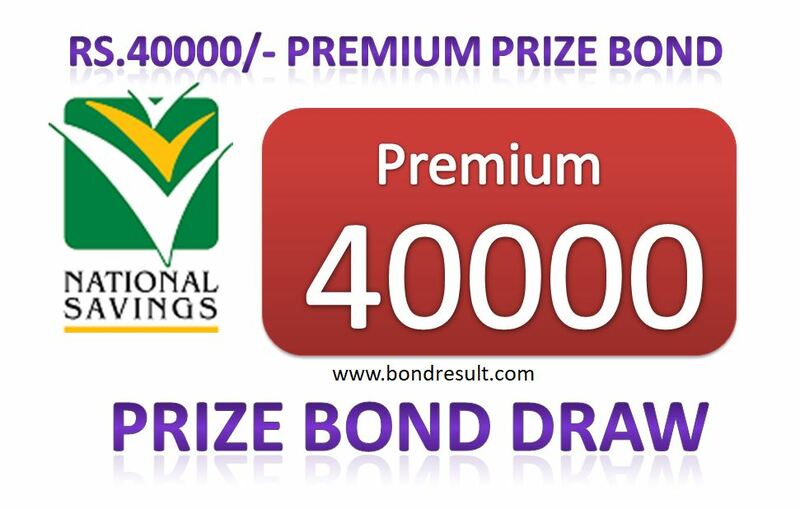 This page of Premium 40000 Prize bond List 2019 provides all previous draws of the aforesaid prize bond and the upcoming draws announcement. You must touch with us for latest prize bond information.